Whilst looking to build some breakout boards we remembered the Sick of Beige (SoB) “standard” of PCB footprints designed by Dangerous Prototypes. 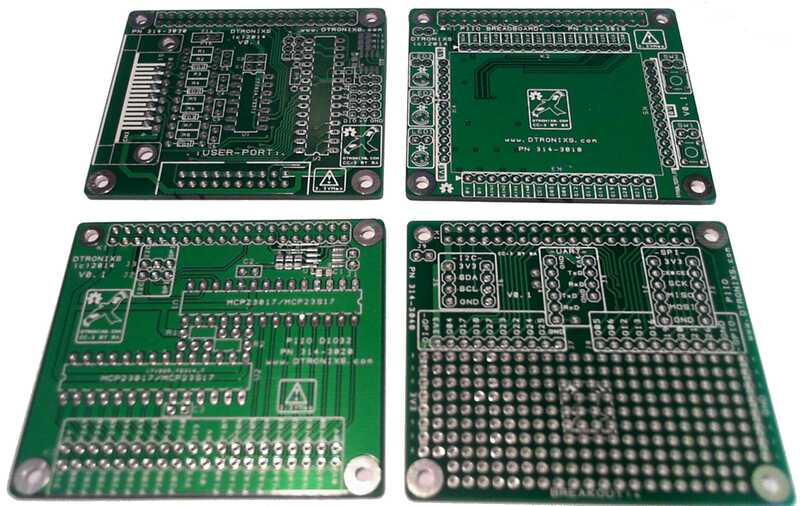 DP have made a really cool set of PCB footprints in various sizes with the added bonus of being designed to be case friendly. Our first Sick of Beige (SoB) board is SoB DB9, using the DP5050 footprint. This is a handy little breakout board for those wanting to build their own 9-way D-Type interfaces be it for RS232, RS485, CAN bus or any other project. A standard 9-way D-Type (Male) connector provides the interface with 3.5mm Screw Terminals connections provided for easy interfacing. In addition a Male Pin Header connections is also provided. Two small circuit prototyping areas are also provided. Relay2 is our latest RPi Zero add-on board. It’s designed to control low voltage and small-ish current devices such as DC motors, servos etc. Relay2 is a 2-ch Relay board with two Change-Over (CO) relays. Each relay is good for 30V AC/DC at 1A. The relays can handle a greater voltage than 30V but given the close proximity of the actually RPi Zero board we would not recommend going above 30V. The relays are easy to select via GPIO headers and they use 3-way Screw Terminals. You’ll find them on our Tindie store. This last month we’ve been working on some new add-on boards for the Raspberry Pi Zero. We’ve just sent these off to be manufactured, so we’ll post an update when we’ve got them back. 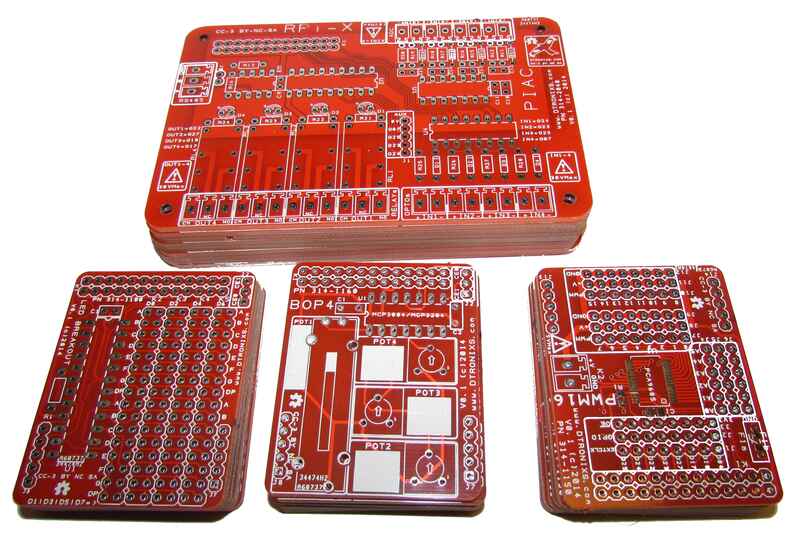 A bumper box of 10 new (yes 10 designs) PCB’s arrived this week. In it were 5 new (and updated) add-on boards for the Raspberry PC and 5 new boards for the Guitar Effect pedal designs we’ve been working on. For the Raspberry Pi, we have a new revision for our popular PIIO ULNB803/GVS board which now features 2 stepper motor connectors for the popular 5v 28YBJ-48 stepper motor. A new revision for the PIAC with new screw terminals. A brand new Digi-IO which is a real world interfacing board with RS485, two relays and some level shifter for inputs. Another brand new PIIO design called “RasPellar” which is a IO co-processor board using the Parallax 32-bit 8-core Propeller CPU and a new HAT sized prototyping board that can be used by it’s self or with RasPeller. For the guitar effects we have two designs for a “modular electronic effects pedal” or MEEP to its friend. The MEEP board design gives you access to the audio In and Out jack sockets, 9V power and Vb (4.5V) as well as the foot switch and features a true bypass while the effects are added via a smaller daughter board. So if you get sick of using one guitar effect you can simply swap it out with a new effects daughter board for a lot less than buying a new pedal. MEEP BB3 (base board – 3 pots) has three Potentiometers (pots) and MEEP BB4 (base board – 4 pots) has 4 pots. To go with the MEEP base boards there is a prototyping board, MEEP Screamer a clone of the awesome Ibanez Tube Screamer pedal and MEEP Fuzzy yet another clone of the just as awesome Arbiter Fuzz Face. 4 new PCB’s arrived in the post today. These are our first HAT’s (Hardware on Top) for the Raspberry Pi B+. All the boards adhere to the standard HAT size and include a ID EEPROM. UserPort is probably our favourite. It’s a mimic of the BBC’s micros digital User Port and Analogue Port. Digital I/O is provided by a I2C MCP23017 16-channel Port Expander and Analogue Inputs by a 4-channel SPI MCP3004 10-bit ADC. Breadboard!+ is a reworking of our earlier 170-pin Breadboard module but the extra size for a HAT PCB has allowed the inclusion of a two tactile push switches and three LED’s. As well as these, there’s also 4x Analogue Inputs using a 4-channel MCP3004 10-bit ADC. DIO32 is a 32-channel Digital I/O board with two MCP23017 I2C Port Expanders. Breakout!+ allows easy access to the I2C, SPI and UART interfaces and includes a small prototyping area for building circuits on. Another box of new boards arrived today. In the box where 4, yes 4 sets of PCB’s. PIAC has 4x SPCO Relays rated at 2A, 4x opto-isolated digital inputs, 4x 0-10V Analogue inputs and finally a RS485 communications port. 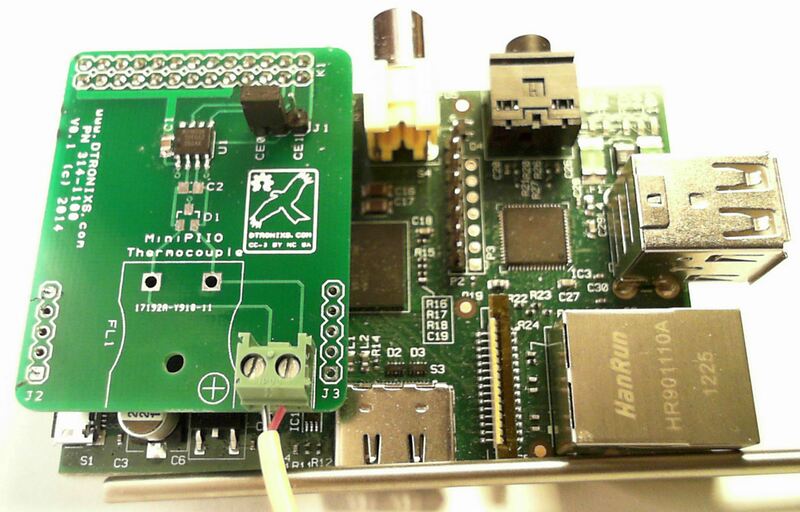 So with the RPi-X PIAC you can learn about industrial control or perhaps use it for your own small industrial project. The final new PCB, is MiniPiio PWM16. I think its name gives it away. It’s a hardware based 16-channel PWM add-on board using the popular PCA9685. As always you’ll find them in our Tindie store in the next few days. A new batch of PCB’s arrived today. There were two new Raspberry Pi add-on boards in the box. The first board is a 2-channel Type-K Thermocouple converter based on the MAX31855 chip. 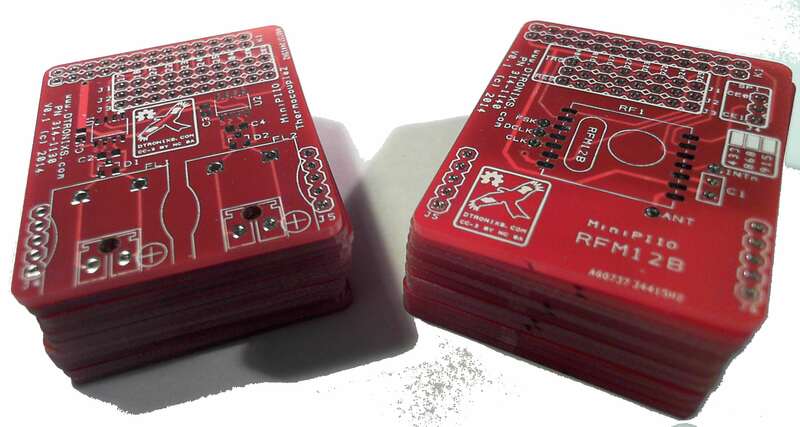 The second board is RF Transceiver based of HopeRF popular RFM12B module. I’ll plan to build them up in the next few days and if all goes well I’ll list them in our Tindie store. The MiniPiio RS485 is a RS485 to TTL 3.3V converter board specifically designed to work with the Raspberry Pi. It uses 3.3V components and is completely voltage compatible with the Raspberry Pi. The board connects directly to the Raspberry Pi’s UART Rx and Tx to provide RS485 half-duplex communications. The board uses the industry standard MAX3485* for signal conversion. An industry standard 9-Way D Connector (Male) and a 3-W screw provides provides the serial connection to the outside world. In addition, the GPIO signals can be used to control the MAX3485* DE and !RE as needed. PIIO and MiniPIIO are modular electronic building block for the Raspberry Pi and may be used with our RPi Expander2. You can find them on our Tindie store. 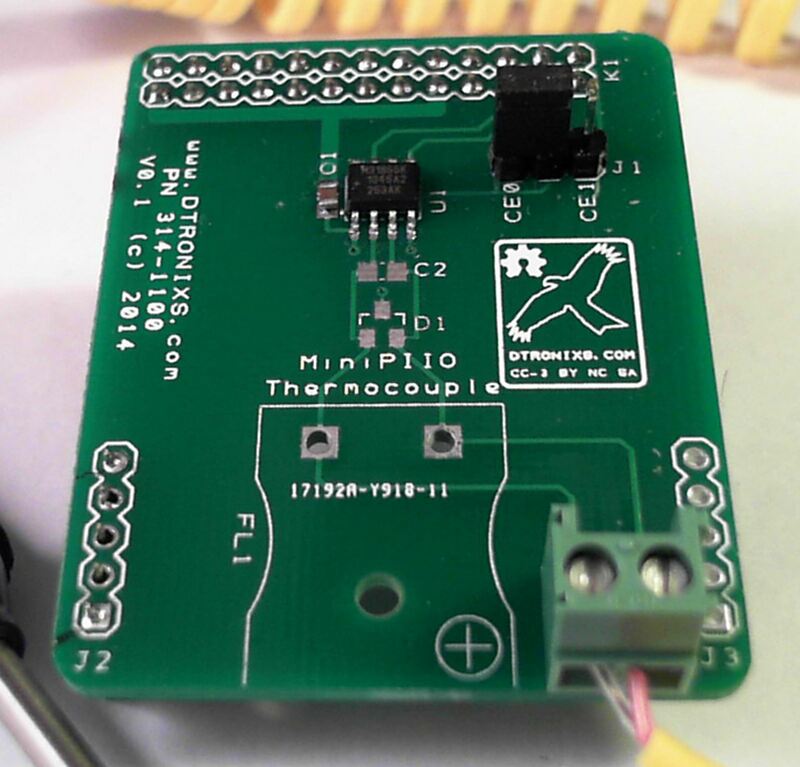 MiniPiio Thermocouple is a single channel temperature measurement add-on board using Type-K thermocouples. The MAX31855 is a sophisticated thermocouple-to-digital converter. It features a built-in 14-bit analog-to-digital converter (ADC) for thermocouple measurement. In addition it also contains a cold-junction sensor for compensation temperature sensing and correction. The MAX31855 resolves temperatures to 0.25°C. It allows readings as high as +1800°C and as low as -270°C and exhibits thermocouple accuracy of ±2°C for temperatures ranging from -200°C to +700°C for K-type thermocouples.